Revolution-seeking cleric Dr Tahirul Qadri has finally struck a “face-saving” deal with the government, leading to an end to the 50-day anti-government sit-in on Constitution Avenue in Islamabad, Pakistan Today has learnt on good authority. The agreement, a copy of which is available with Pakistan Today, states that Qadri’s Pakistan Awami Tehreek (PAT) will call of the sit-in and the deal would be kept “confidential” and “shall not be shared with any third party or person except with mutual written agreement”. Minister for Planning and Development Ahsan Iqbal signed the agreement on behalf of the federal and Punjab governments while PAT President Dr Raheeq Abbasi signed it on behalf of the PAT chief. “Qadri felt that he has been isolated by Pakistan Tehreek-e-Insaf (PTI) Chairman Imran Khan’s solo-flight to hold public gatherings across the country,” said a government source privy to the details of the pact, adding that the cleric thought it better to strike “a quiet, face-saving deal with the government”. “This is the reason why Qadri allowed his followers to leave for their hometowns for Eidul Azha and also announced that he would be holding public rallies in other cities. 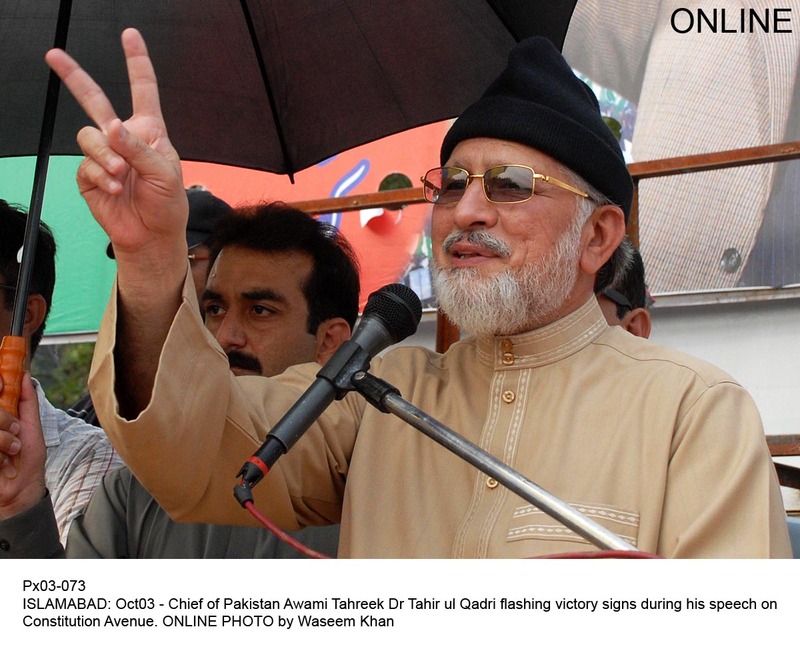 This was the safest retreat for Qadri and he grabbed the opportunity,” said the source. The pact makes no commitment to Qadri about an impartial probe into the Model Town massacre neither has the government committed to forming a follow-up judicial commission to investigate the matter afresh. “This pact is nothing but a lollypop given by the government to the firebrand cleric who returned home empty-handed in 2013 as well,” said the source. A source said that these nine cases relate to terrorism, which under the law could not be withdrawn without a thorough investigation by the JIT. Pakistan Today had reported two days ago that the two sides were in secret talks and an agreement was likely. A PAT spokesperson had then confirmed talks with the government but on Friday the spokesperson refused to confirm or deny that the party had reached an understanding with the government. That's a good face saving for TUQ. I guess Qadri just couldn’t resist missing out on the BBQ stakes during eid…. This article is a lot of rubbish. Lies, lies and more lies. Nobody should believe any of this. This is meant to deceive people into thinking things are wrapping up. How can this agreement be 'confidential' if it is already in the national newspapers? There is no reason at all for Dr. Qadri to feel isolated by Imran Khan's going to other cities. More likely, he felt inspired by IK's successes, and is seeking to imitate them. already put a question mark at the political vision and commitment to the state of both the leaders.